Sandra always annoyed and repelled me as an actress. Her looks are average. Maybe the weirdest one I can think of is Sandra Bullock. She gets knocked as being too "girl next door" looking. But something about her is so HOT! And that's before her "Miss Congeniality" movies where she was dolled up. ugh. are you not on your medication?? The guy is gross. 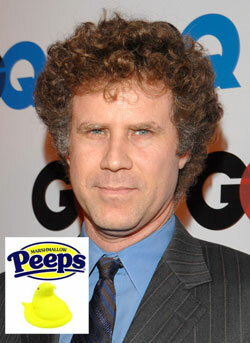 Will Ferrel, anyone? If I were gay I'd go for him, cuz just looking at him makes you want to laugh. YouTube - Everclear "I Will Buy You A New Life"
Craig Ferguson is adorable. I like the guy. I'm gaggin to shag Craig Ferguson. John Goodman? He makes Jabba the hut look like a tic tac. Put your glasses on. Sean Penn, Ben Stiller, Steve Martin, John Goodman, Hey I don't understand them myself...go figure. Oh but they are HOT! Aderson Cooper is so cute and he is an old man. Anderson Cooper..............I know he's gay but there's something about him that I find SO attractive and appealing. let me guess you like "animated" or "digitally created" women? Artsy, you didn't say anything about my choices. I asked ya if you likie. Tom Cruise is definetly weird, and a control freak too, I'm sure. This one is going to sound really weird,but Conan O'Brian is kind of cute (and very funny)! I also llike Hugh Laurie (great blue eyes) and James Spader. And Owen Wilson!